Pirate Business: From Booty To Bonuses In recent years, Somali piracy has grown into a multimillion-dollar criminal enterprise. Law enforcement sources say the larger pirate syndicates are becoming increasingly professional. Last year, authorities found a pirate contract that even included incentive bonuses. An armed Somali pirate keeps vigil along the coastline of Hobyo, a pirate lair on the Indian Ocean. The last in a three-part series. 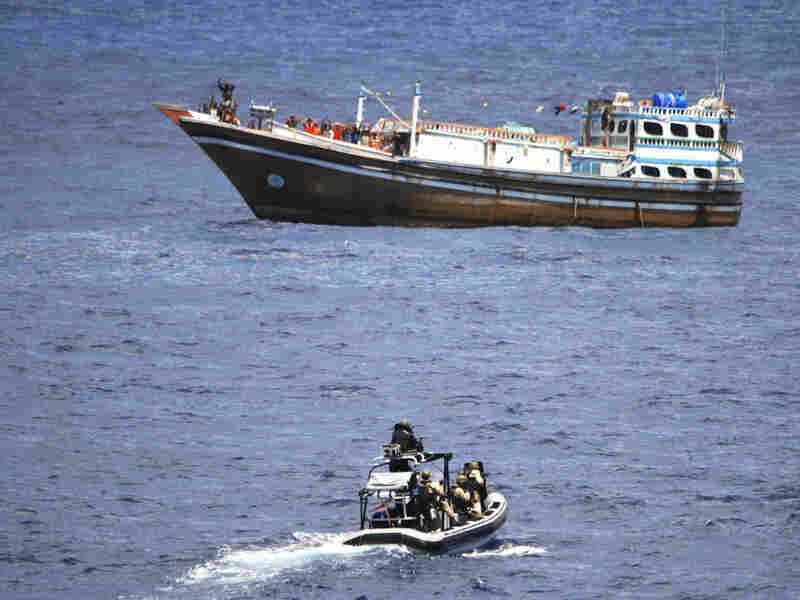 In recent years, Somali piracy has grown into a multimillion-dollar criminal enterprise. Rarely a week goes by that pirates don't attack or seize a ship. There were even incentive bonuses. "What was striking were bonuses for being first on board another ship," said Miller. In fact, piracy researchers say the first on board can sometimes win a Toyota Land Cruiser. 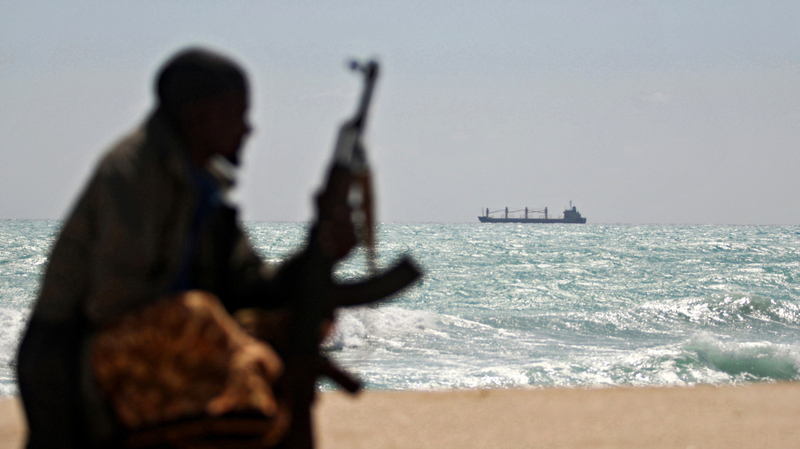 Piracy thrives in Somalia for two reasons. First, Somalia is one of the world's most failed states. In practice, that means pirates can work in areas where there are no police — or police who are easily bribed. Second, Somalia is a desperately poor country, and the money in piracy is comparatively huge and hard to resist. Moha works as a security officer in Hargeisa, the capital of Somaliland. Because of the risks associated with his story, he asked that only his first name be used. Several years ago, Moha visited the neighboring pirate hotbed of Puntland. He says a friend hooked him up with a pirate, who tried to recruit him. "He was a very simple guy, did not have any fancy clothing or anything," Moha recalled of the pirate. "He had an AK-47 machine gun and he had a plastic ... bag, and there was some money in it." As an enticement, the pirate asked Moha to count the money. Moha says it took 2 1/2 hours and amounted to hundreds of thousands of dollars. Knowing Moha speaks fluent English, the man offered him a job translating hostage negotiations. Moha wondered why the pirate couldn't find someone local. He says the pirate told him it was hard to find decent translators in Puntland. They had to bring them from Dubai, which just extended the time it took to get ransom money. "I was really tempted," said Moha, chatting in an open-air restaurant along the Somaliland coast, looking out on the Gulf of Aden. One of [the pirates] told us he didn't know his family was so big before he went into piracy — because now, all of a sudden, he had all these dependents running after him to get money. Moha says he couldn't sleep that night. Somalis typically make $200 to $300 a month. The translating work would provide a lifetime's worth of wages and pay for a new house, an SUV and other things. But Moha was wary. As an outsider, he had no local clan to protect him in Puntland and feared that as soon as his translation job was finished, he would be, too. "Once we come on land, he will tell his cousin who doesn't have any money, 'This guy is from Hargeisa; shoot him in the head and take the money,' " Moha said. Moha says he never contacted the pirate again and slipped out of town. Stig J. Hansen, who teaches international relations at the Norwegian University of Life Sciences and studies piracy, says a successful hijacking can net an ordinary pirate $35,000 to $50,000, or even more. But he says the pirates' purchasing power is not as strong as you'd think. The flow of ransom money into local Somali economies drives up prices, and pirates' relatives nag them for cash. As part of his research, Hansen has interviewed more than 30 pirates. "One of them told us he didn't know his family was so big before he went into piracy," Hansen recalls, "because now, all of a sudden, he had all these dependents running after him to get money." Hansen says many pirates try to retire after a hijacking or two. They find the working conditions too risky and worry about swamping skiffs in high seas. "Most of them said they wanted to establish some import/export business," Hansen says. The big pirate syndicates are becoming more professional, he says, but some smaller operators are surprisingly incompetent. In this photo released by the Dutch defense ministry, suspected pirates stand on deck with their hands raised as Dutch marines approach a hijacked Iranian fishing boat off the coast of Somalia on April 4. "Some of the habits of these pirates are very strange," Hansen says from his home in Norway. "I encountered older pirates who were big failures, forgetting to tank enough fuel, doing rough things with their engines. You know, they're not good at maintaining their skiffs at all." Shirwac, a pirate spokesman, says pirates' biggest challenges today are foreign naval warships that he says are increasingly resorting to force. Shirwac, who asked that only his first name be used, works in the Somali town of Hobyo, a pirate lair on the Indian Ocean. Speaking by cellphone, he cited a case this month in which Dutch marines killed two of his fellow pirates in a shootout to free an Iranian fishing boat. "We were talking to them on the phone. This was our own pirate militia," Shirwac said. "They told us two of them were killed, four sustained injures and the remaining 12 were OK. They told us the marines had just jumped onto their boat. And that's the last thing we heard." Somali pirates are hip to the Western media. Eager to spin a sympathetic tale, Shirwac claims pirates are really just an informal coast guard that cracks down on illegal fishing and levies "taxes." "We are not pirates," Shirwac insists. "We are the people guarding our coastline. The pirates are the people who invaded. They have come from over 5,000 miles away with warships and planes." But experts say the idea that pirates are environmental Robin Hoods is ridiculous. Illegal fishing is a big problem around Somalia, and foreign trawlers have exploited Somalia's internal problems for their own gain. But most of the pirate hijackings occur hundreds of miles offshore, and most targets are cargo ships — even oil tankers — which have huge ransom values and nothing to do with fishing. In the end, scholars like Hansen say, Somali piracy is what it is: a high-stakes, high-risk business.